Another work in progress! This copper tree is part of a commission for James Monroe elementary school in Edison, NJ. On March 1, I blogged about the bird that will be perched in this tree and now the tree is starting to take shape. Because the process of constructing this tree is new to me, I’ve been struggling a bit with how to attach the branches. My idea was to temporarily affix them with epoxy and then wrap the entire tree in copper wire for texture and interest. But the epoxy has been giving me problems and I wasn’t sure this would work. Over the past few days, I spent a lot of time sitting on the floor of my studio, fiddling with wire, tubing, epoxy, screws, and tape. I decided to do a test branch and wrapped it with wire to see how it would hold— and it worked! So I ordered 10 rolls of 18 gauge copper wire (a total of 2,000 yds. which I hope will be enough). I also had the idea to make a little owl who is tucked into a hole in the tree— you can see the top of his head peaking up at the bottom of the photo. He is a visual reference to the school’s mascot and a tie in with the commission I created for them last year. So much more to do but it’s coming along, little by little. Before I had kids in high school, it sounded like so much fun to go through the process of deciding where they would go to college. I thought of the college trips we would take, the tours, all the options for them to go learn, experience, and explore… And then we arrived at this point— two years ago for my son and this year for my daughter. The truth is: it is exciting but it’s also really stressful. Considering all the changes this decision brings means each one of us has melted down a few times during the process, maybe me most of all. Because, to me, this is probably the end of having these lovely people living in our home which has been our reality for 20 years. My son decided on a school that is a 6 hour drive away and that makes it tough to squeeze into a weekend. Having seen the challenges that distance brought, my daughter kept her search a bit closer but for a while was leaning towards the Washington, DC area since she’s interested in International Relations. However, during her search process, she found the School of Diplomacy and International Relations at Seton Hall and things began to change. The program seems amazing with its access to internships in New York City as well as the opportunity to study in Washington DC for a semester if she wants. The caliber of professors and students in the program made this her first choice and it doesn’t hurt that it’s a 40 minute drive away. So her decision is made— she’s going to be a Pirate! Ahoy! For the past five years, I have had the pleasure of working with a Metuchen High School student intern. The program pairs interested high school students with local businesses to provide an inside look at how work gets done. Each year, the students who have come to spend a few hours per week with me have been really interesting, motivated kids. They come to my studio after spending a full day at school and often before they head off to other activities at night. I’ve been fortunate that they all have been flexible and willing to work on different projects each time. This year, my intern is a sophomore whose favorite medium is oil paint but she’s had no problem jumping in to learn screen printing, mobile making and cutting glass to make jewelry. She’s enthusiastic, funny and willing to learn and try. For her, I hope the experience is helping her see from the inside that running an art business can be both chaotic and mundane, depending on the day. Ultimately she may not go into a career in art but I think that the same can be said about almost all jobs— some days are fun and crazy and others are more routine. Whether it’s through an internship, a summer job, or a part-time job during the school year, I think the practical knowledge that can be gained outside of the classroom offers valuable lessons for teenagers. And I truly enjoy the opportunity to share my business with these great kids! Since much of my work consists of residential commissions, I value a good photograph to share with future clients. Unless you’re friends with or family of my clients, you will probably not see this window which is now installed in their home. However, a great photograph allows me to share it. And that becomes my question as I get ready for an installation— what makes a great photograph? I own a decent camera but I don’t have a lot of photography skills or Photoshop knowledge and glass is tricky to photograph. Sometimes I get lucky but other times my attempts fall short. In photographing this window, there’s the issue of the clear glass in the center. Although it’s textured, when you look at the clear glass you see through to what’s on the other side. Sometimes a photograph taken of the window installed looks lovely as you can see through to the outside but other times I like the image to look clean as was the case with this. Also, for some reason, red is a hard color to photograph- it tends to look kind of orange. Additionally there are textures and bevels that are such a big part of the beauty of glass but that are hard to capture unless you know what you’re doing. I blogged about this window on February 1 when it was a work in progress on my workbench; the image I shared then was what I could manage but I’m so happy I decided to take the finished piece to my friend, David Glasofer of Image Up Studio who takes such time and care with photographing my work (and, of course, with all the work he shoots). If you have the good fortune to be friends with or family of my clients, you’re lucky because they are wonderful people. 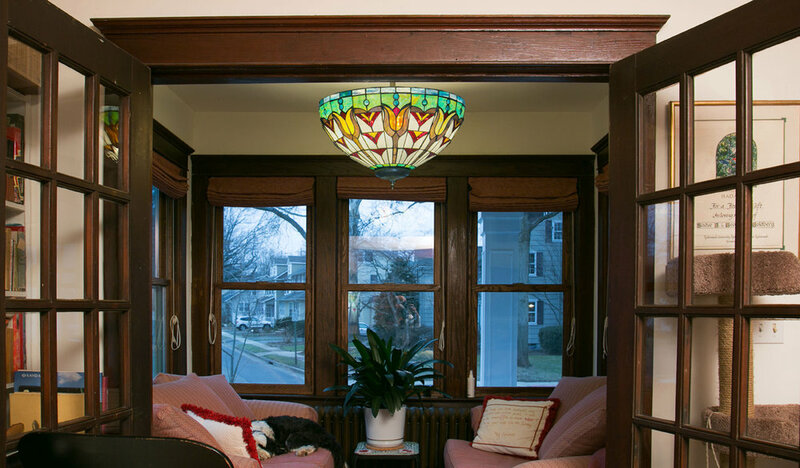 And also because you can see this window in person which is how it looks the best. But if not, thanks to David, you can still see a really terrific photograph of it! If you follow me on Instagram (https://www.instagram.com/paradisecsg/), you might have seen this little bird as she is starting to develop. I have been working on her, off and on, for a few months based on some drawings that were done by a very special little girl (more on that at a later date). I knew I wanted to make her out of copper wire but, as I am still finding my way with 3-D work, I wasn’t quite sure how to translate the drawing into a 3 dimensional form. Using the drawing as a guide, I started wadding up newspaper and taped it together with masking tape until I created a very rough looking bird which became my model. 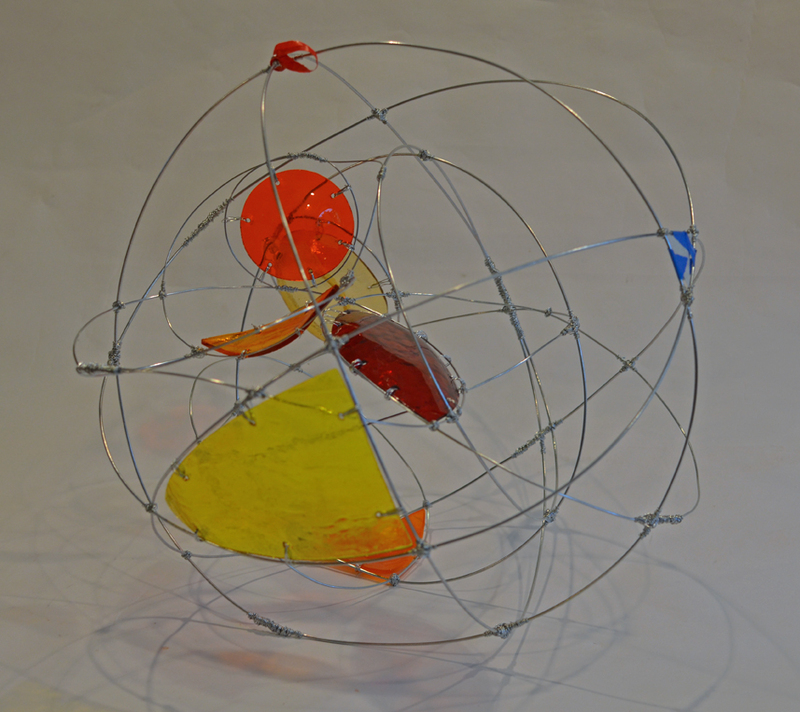 From there, I started creating the copper wire bird. The next step has been to add on wings and a tail which I am shaping out of copper sheeting which I have torch fired with multiple coatings of purple enamel. The tail isn’t quite done and she still needs some copper legs and feet but she’s coming along! Also in the background you can see some red glass cherries that I fused with copper stems so they can be attached to a copper tree that is starting to develop in my imagination. There’s a long way to go— it starts in the imagination but it comes to life in the studio. Stay tuned for more on this project in the coming months! One thing that really warms my heart is a person who gives a very thoughtful gift. When the giver takes the time to think about what the receiver values and gives a gift that honors and celebrates those priorities, it’s pretty incredible. And I feel especially lucky, as an artist, when I get to be a part of that. A client reached out to me in the fall to create a gift for his mom’s 70th birthday. I blogged about this stained and fused glass family tree on December 6, 2018 when I first began creating the tree and this is a photo I took of the finished product. Her birthday was in January but the weather prevented him from being able to give her the gift on time and I didn’t want to ruin his surprise by posting about it before she received it. As I was creating it, I kept thinking about how happy she will be each time she looks at the gift that came from her son and recognizes her deep love of her family. Happy 70th birthday! I was commissioned to create a logo piece for a client whose boss is celebrating 10 years with their company. The logo itself is fairly straightforward and they were very flexible with how the overall piece should look. So I started fiddling around and found these really cool beveled squares that I had bought on a whim years ago because I liked the way the dichoic coating lit up the center of the square. The company’s colors are orange and gray and the dichoic coating has a reflective, orange glow— they were meant for this project! The other feature that we had discussed was the cloud. As a cloud-based technology company, this emblem was something they identified with but didn’t have a clear vision of how to incorporate it. Initially I had built up a little cloud shaped pile of frit (think: ground glass the texture of sand) on the surface of the clear center piece. I was planning to put it in the kiln in the morning when I woke up thinking, “I can’t do that! The glass will spread out and it will look like a pile of mush!” (Truly, I woke up thinking this. I’m not making this up!) So I scraped it off and came up with a way to create a cloud shaped indention to hold the frit in the right shape and guess what? It worked! It’s really thoughtful that my client is giving this as a gift to his boss— he told me she’s a very strong leader and she sounds like a great boss. It makes me happy to help him celebrate her— congrats, Rebecca! Keep up the good work! “I like it! What is it?” my daughter said. “It’s a sun!” I replied. Well, truthfully, it’s an under construction sun. If you look closely, you can see a red piece of tape reminding me of where the top is and on the right side is a pattern piece still taped in— and there will probably be more. At first I had intended to have 3-4 glass pieces but the more I add, the more I like it. The shapes are popping out and the colors look even more beautiful as they overlap. Adding the glass is pretty interesting because the shapes first must be cut from a sheet of glass and ground to fit, then I drill multiple holes in each one, then slump them in the kiln to get the correct shape, and finally, carefully wire them in. Eventually this will be hung, together with a butterfly mobile I’m creating , in an elementary school in Summit, NJ (I blogged about the butterfly portion on December 21, 2018). It’s been really fun to work on this commission; this portion is unlike anything I’ve done before. I did a site visit to the school the other day to confirm important details about the hanging of the pieces even though I still have a ways to go with the whole project. The staff was very friendly, helpful and nearly as excited as I am for this piece to hang in their lovely front office. More photos to come as it develops further. When my kids were little, they used to take the bus to both the elementary & middle schools with a group of kids from our neighborhood. One of the girls was the same age as my daughter and was a character from as far back as I knew her. She often arrived at the bus stop at 8 am with her lips stained orange from the soda she was drinking and she would alternate between arguing with her brother and dancing. When they reached high school age, she turned her passion for dance into her school choice as well and began attending a county vo-tec high school where she spends much of her day dancing. She’s even going to college next year as a dance major; her feet never stop moving. Thinking of her in this way, I was a little surprised a few months ago when she reached out to ask if I could help her learn to weld. For an independent study, she was encouraged to learn a different art form and she wanted that to be welding. We’ve had a lot of fun over the past month working on the basics and creating projects with her grandfather’s old tools. A few years ago, I had made a bunch of glass flowers using old railroad spikes as stems. As much as I enjoyed making them, I had gotten out of the routine but working with Molly inspired me to make another. I’m donating this one to Metuchen School’s PT Council for their annual fundraiser so I used the school colors for the flower and added some gears to the bottom as a nod to other typical modes of transportation in the borough. Thanks, Molly, it’s been a pleasure working with you and I can’t wait to see what you do next— a dancing welder, who would have thought? I’m so lucky to live a short train ride from New York City where I can visit some of the world’s great art museums. 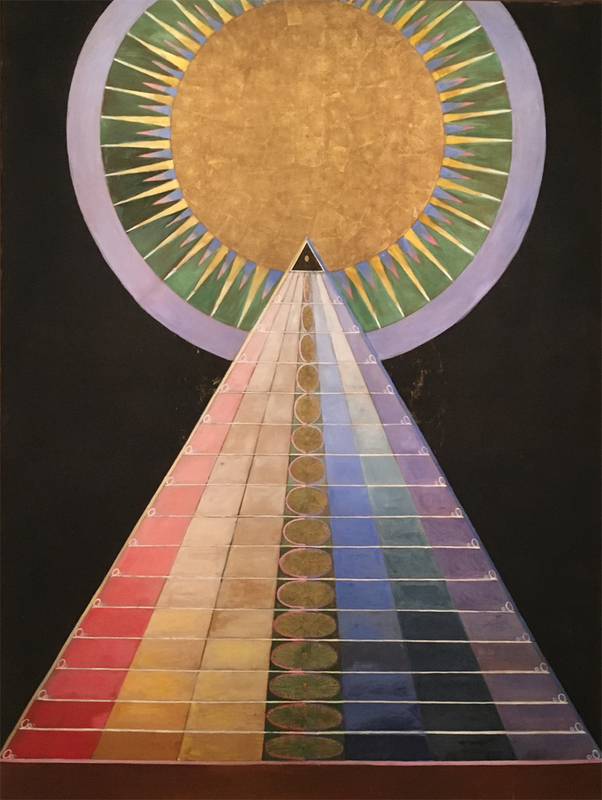 I took a day off yesterday and saw the amazing exhibit of Hilma af Klint at the Guggenheim. Full disclosure, I’m usually not a huge fan of modern art. I often feel like I just don’t get it and truly, in this exhibit, I’m not sure I “got it” either. But I was blown away. First, she’s a female artist who predated a number of male artists who are credited with “discovering” modern art. So “who discovered what when” is interesting. But she also had seances and felt she was channeling spirits through her work. So there’s that. Then there’s the fact that she foretold the creation of the Guggenheim and described the venue that would ultimately house this exhibition in great detail before it was even conceived by Frank Lloyd Wright. Finally,there were all the stylistic changes in her work. In one period, she covered canvases with large, colorful flowing spirals in oil paint and the very next year, much of her work featured a single water color square on butcher paper. It made for a jarring walk through a building that wraps around itself multiple times. To me, it was a reminder that while we we cycle through the same seasons and events each year, we shouldn’t expect things to always be the same. There are changes and surprises around each turn. Like Modern Art, sometimes making sense of it is challenging. Perhaps a seance might help me figure it out? Last week, I did something I had never done before: I scheduled an appointment with my photographer friend, David Glasofer to take a photo of a piece I hadn’t even bought the materials to create yet! I had accepted a last minute commission to make a glass mobile for a retiring elementary school secretary whose going away party was yesterday. Because it was something they thought of late and my schedule is really busy, we came to an agreement that I would create a section of the mobile and send them a photo of the “work in progress.” They shared the photo with her and she will come back to the school for a dedication of the piece which will hang in the office that she has run with kindness and care for 21 years. I created a section of the mobile with 7 butterflies— there will be 2 other sections, also with 7 butterflies each, the total representing her years of service to Lincoln Hubbard elementary school in Summit, NJ. I haven’t met her yet but she is described as a warm, loving woman so she will also be represented in the mobile as a sun that the butterflies flutter around. There are some surprise details that will adorn a couple of the other butterflies that I think she will really appreciate. With the photo taken and presented, I have a few other commissions that I am turning my attention back to for now but will finish this mobile in the beginning part of 2019 and will post more photos when it’s complete. Happy retirement, Yvonne! Back at it! After back to back weekends of holiday shows and making of all sorts of gift items, I am digging back into this commission of a stained glass family tree. My client saw a photo of one I had created a number of years ago and reached out for a custom gift honoring his mom on her 70th birthday. The first step in the process is making the 2-D stained glass tree and sky which measures about 24” x 36” and will be set into a oak frame. Once the tree is complete, I will create glass leaves that have a wire stem fused in and I will paint family members’ names on them. Since his mom is one of 8 siblings, the names on the leaves will be doubled up occasionally for some married couples and siblings; it’s a dense tree! 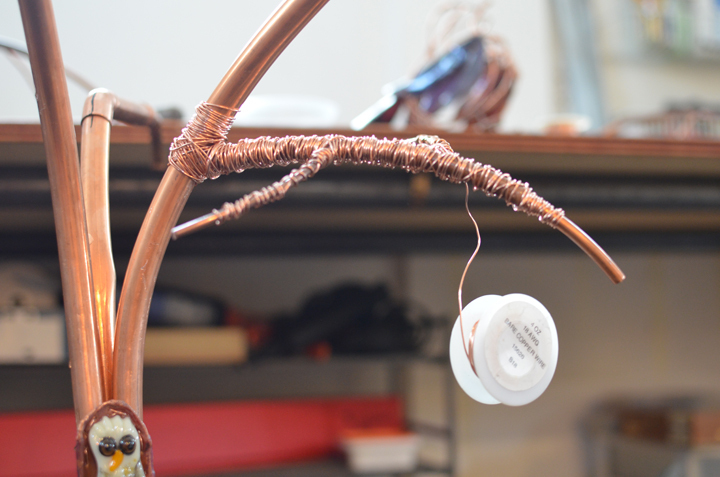 The wire stems of the leaves will be soldered to the branches so they will actually hang off the tree. I really love creating meaningful artistic gifts like this because I know they will be cherished by the receiver and are a joy for the giver as well. As you can see from the drawing, there’s a long way to go with lots of tiny, twisty branches and not to mention all those leaves! But I know how happy his mom will be when she receives this— onward I go. Every year at this time I get really excited for Metuchen’s annual art party: Eat, Drink, and Buy Art! Transformations Gallery has been hosting it for the past 8 years and part of the fun is that it changes— in location, artists, and we offer a special twist— each year. This year we are back at the Old Franklin Schoolhouse, a smaller venue, which means we had to be super selective with our artists and many of them have been with us since the beginning. The twist this year is we will be having our usual Saturday night event from 5:30-9:30 pm and also a full-day of shopping on Sunday from 11 am- 4 pm. Since the Schoolhouse is the location for picking up booklets for the Holiday House Tour, you can do that at the same time as checking out the art. If you have been to the event before, you know how much fun it is. And if you haven’t, you really ought to check it out. It’s free and open to the public! Hope to see you either— or both— Saturday or Sunday. As the smell of turkey fades, we are starting to gear up for the next holiday and I am excited to be taking part in #SmallBusinessSaturday with an open studio sale. Tomorrow, Saturday, November 24 is the day we’re encouraged to #shopsmall and support the small businesses in our communities. My studio will be open from noon- 3 pm with a variety of holiday gifts including traditional favorites like jewelry and coasters as well as new items like glass mistletoe! Hope you can stop by and visit! I’m writing this post from snowy Johnstown, PA. But next to the forge at the Center for Metal Arts, it’s toasty warm! I came here to create metal embellishments for a lamp commission and it has been a great experience. I was looking for a well equipped metal shop and an experienced metal worker to give me some one-on-one help as well as tools I could use on my own. I hit the jackpot! Dan Neville, one of the co-owners, is a wealth of knowledge, super patient, and really easy to feel comfortable around as I make my metal forming debut. I have one final day to work on these pieces and I have high hopes. Stay tuned for more photos and if you want to see a video of some of the work being created, check out my Instagram.